37 CFR 1.171 Application for reissue. In either case, the amendment must be made pursuant to 37 CFR 1.173(b) and must comply with all the provisions of 37 CFR 1.173(b)–(e) and (g). Note that the provisions of 37 CFR 1.53(b), effective December 18, 2013, stating that an application may be accorded a filing date “with or without” claims, does not apply in reissue applications, as 37 CFR 1.173(a)(1) requires the filing of the entire specification, including the claims of the original patent. A preliminary amendment cancelling all original claims without presenting any new claims would be inappropriate under 37 CFR 1.115(b)(1). If an application is filed without claims but otherwise complies with 37 CFR 1.53(b) and the reissue rules, the Office of Patent Application Processing (OPAP) will accord a filing date and send out a notice of missing parts setting a period of time for filing the missing part and for payment of any surcharge required under 37 CFR 1.53(f) and 37 CFR 1.16(f). Pursuant to 37 CFR 1.173(a)(1), applicant is required to include a copy of any disclaimer (37 CFR 1.321), certificate of correction (37 CFR 1.322–1.324), reexamination certificate (37 CFR 1.570 and 1.997) or certificate from a trial before the Patent Trial and Appeal Board (PTAB) (37 CFR 42.80) issued in the patent for which reissue is requested. If there was a prior change to the patent (made via a certificate, reissue of the patent, disclaimer, etc. ), the first amendment of the subject reissue application must be made relative to the patent as changed by the prior proceeding or other mechanism for changing the patent. The initial contents of a reissue application are discussed in detail in MPEP § 1410.01 through § 1418. For expedited processing, new and continuing reissue application filings under 37 CFR 1.53(b) may be addressed to: Mail Stop REISSUE, Commissioner for Patents, P.O. Box 1450, Alexandria, VA 22313-1450. Mail Stop REISSUE should only be used for the initial filing of reissue applications, and should not be used for any subsequently filed correspondence in reissue applications. Reissue applications may be filed through the Office’s web-based electronic filing system (EFS-Web). See MPEP § 502.05. When filing a reissue application electronically, an applicant should choose the “reissue” radio button. Regardless of the manner of filing, all new reissue filings should include a copy of a completed Reissue Patent Application Transmittal Form (PTO/AIA/50) to ensure that the filing of the new application will be recognized as a reissue application. (c) APPLICABILITY OF THIS TITLE.— The provisions of this title relating to applications for patent shall be applicable to applications for reissue of a patent, except that application for reissue may be made and sworn to by the assignee of the entire interest if the application does not seek to enlarge the scope of the claims of the original patent or the application for the original patent was filed by the assignee of the entire interest. 37 CFR 1.172 Reissue Applicant. (a) The reissue applicant is the original patentee, or the current patent owner if there has been an assignment. A reissue application must be accompanied by the written consent of all assignees, if any, currently owning an undivided interest in the patent. All assignees consenting to the reissue must establish their ownership in the patent by filing in the reissue application a submission in accordance with the provisions of § 3.73(c). (b) A reissue will be granted to the original patentee, his legal representatives or assigns as the interest may appear. 37 CFR 1.175 Reissue oath or declaration. For reissue applications filed on or after September 16, 2012, the reissue applicant is the original patentee, or the current patent owner, if there has been an assignment. However the inventor, or each individual inventor who is a joint inventor of a claimed invention, must execute an oath or declaration for the reissue application, except as otherwise provided in 37 CFR 1.175(c). A reissue applicant may file a substitute statement in lieu of the inventor’s oath or declaration as provided for in 37 CFR 1.64 (see MPEP § 604). In addition, the inventor’s oath or declaration may be signed by the assignee of the entire interest if (a) the reissue application does not seek to enlarge the scope of the claims of the original patent (37 CFR 1.175(c)(1)), or (b) the application for the original patent was filed under 37 CFR 1.46 by the assignee of the entire interest (37 CFR 1.175(c)(2)). For continuation or divisional reissue applications, a copy of the inventor’s oath or declaration from the earlier-filed reissue application may be used, provided that: (1) the inventor, or each joint inventor of a claimed invention, in the reissue application executed an inventor’s oath or declaration for the earlier-filed reissue application, except as provided in 37 CFR 1.64; (2) the continuing reissue application does not seek to enlarge the scope of the claims of the original patent; or (3) the application for the original patent was filed under 37 CFR 1.46 by the assignee of the entire interest. Depending on the circumstances, either Form PTO/AIA/05, Reissue Application Declaration by the Inventor, or Form PTO/AIA/06, Reissue Application Declaration by the Assignee, may be used to prepare a declaration in a reissue application. 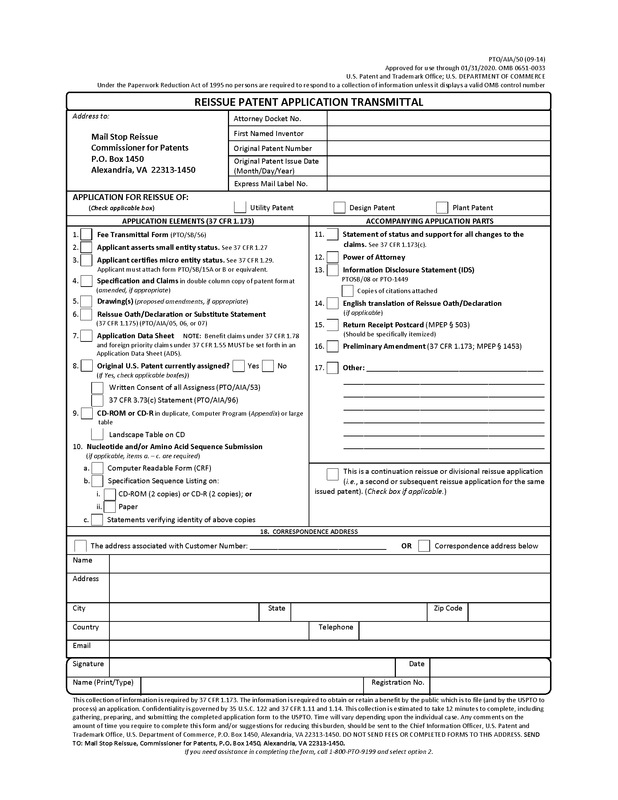 These forms are reproduced in MPEP § 1414, which includes additional information on the content of reissue oaths or declarations, such as when the statement of at least one error in a copy of the inventor’s oath or declaration from the earlier-filed reissue application will be accepted by the Office. 35 U.S.C. 251 (pre-AIA) Reissue of defective patents. The provisions of this title relating to applications for patent shall be applicable to applications for reissue of a patent, except that application for reissue may be made and sworn to by the assignee of the entire interest if the application does not seek to enlarge the scope of the claims of the original patent. Pre-AIA 37 CFR 1.172 Applicants, assignees. (a) A reissue oath must be signed and sworn to or declaration made by the inventor or inventors except as otherwise provided (see §§ 1.42, 1.43, 1.47), and must be accompanied by the written consent of all assignees, if any, owning an undivided interest in the patent, but a reissue oath may be made and sworn to or declaration made by the assignee of the entire interest if the application does not seek to enlarge the scope of the claims of the original patent. All assignees consenting to the reissue must establish their ownership interest in the patent by filing in the reissue application a submission in accordance with the provisions of § 3.73(b) of this chapter. For reissue applications filed before September 16, 2012, the reissue application must be made by the inventor or the person(s) applying for a patent in place of the inventor as provided in pre-AIA 37 CFR 1.42, 1.43, and 1.47 (see MPEP § 409.01(b) and § 409.03et seq. ), except that the application for reissue may be made by the assignee of the entire interest if the application does not seek to enlarge the scope of the claims of the original patent. See pre-AIA 35 U.S.C. 251, third paragraph. The reissue oath must be signed and sworn to by all the inventors, or declaration made by all the inventors, except as otherwise provided in pre-AIA 37 CFR 1.42, 1.43, and 1.47. Alternatively, pursuant to pre-AIA 37 CFR 1.172, where the reissue application does not seek to enlarge the scope of any of the claims of the original patent, the reissue oath may be made and sworn to, or declaration made, by the assignee of the entire interest. Depending on the circumstances, either Form PTO/SB/51, Reissue Application Declaration by the Inventor, or Form PTO/SB/52, Reissue Application Declaration by the Assignee, may be used to prepare a declaration in a reissue application. These forms are reproduced in MPEP § 1414, which includes additional information pertaining to reissue oaths or declarations. If an inventor is to be added in a reissue application, a proper reissue oath or declaration including the signatures of all of the inventors is required, except where the assignee of the entire interest can properly sign the reissue oath or declaration. If one or more inventors are being deleted in a reissue application, an oath or declaration must be supplied over the signatures of the remaining inventors, except where the assignee of the entire interest can properly sign the reissue oath or declaration. Note that although an inventor being deleted in a reissue application need not sign the oath or declaration, if that inventor to be deleted has any ownership interest in the patent (e.g., that inventor did not assign away their rights to the patent), the signature of that inventor must be supplied in a consent to the filing of the reissue application. See MPEP § 1410.02 as to consent of assignee and MPEP § 1412.04 as to correction of inventorship via reissue. A reissue application, whether filed before, on, or after September 16, 2012, must be accompanied by the written consent of all assignees, if any, currently owning an undivided interest in the patent. In addition, all assignees consenting to the reissue must establish their ownership in the patent by filing in the reissue application a submission in accordance with the provisions of 37 CFR 3.73. Where no assignee exists, applicant should affirmatively state that fact. This can be done by simply checking the "NO" box of item 8 of Form PTO/AIA/50 (for applications filed on or after September 16, 2012) or item 7 of Form PTO/SB/50 (for applications filed before September 16, 2012), which form may be signed by the inventors, or by a registered practitioner). If the file record is silent as to the existence of an assignee, it will be presumed that an assignee does exist. This presumption should be set forth by the examiner in the first Office action alerting applicant to the requirement. It should be noted that the mere filing of a written assertion of small entity status (see MPEP § 509.03) or a certification of micro entity status (see MPEP § 509.04) in no way relieves applicant of the requirement to affirmatively state that no assignee exists. Where a written assertion of small entity status, a certification of micro entity status, or other paper in file indicates that the application/patent is assigned, and there is no consent by the assignee named in the written assertion of small entity status or the certification of micro entity status, the examiner should make inquiry into the matter in an Office action, even if the record otherwise indicates that the application/patent is not assigned. The reissue oath or declaration must be accompanied by a written consent of all assignees. Thus, where an application is filed without an oath or declaration, or without the consent of all assignees, if the application otherwise complies with 37 CFR 1.53(b) and the reissue rules (particularly 37 CFR 1.173(a)(1) and 1.173(b)(2)), the Office of Patent Application Processing (OPAP) will accord a filing date and send out a notice of missing parts setting a period of time for filing the missing part and for payment of any surcharge required under 37 CFR 1.53(f) and 37 CFR 1.16(f). If the reissue oath or declaration is filed but the assignee consent is lacking, the surcharge is required because, until the consent is filed, the reissue oath or declaration is defective, since it is not apparent that the signatures thereon are proper absent an indication that the assignees have consented to the filing. The XYZ Corporation, assignee of U.S. Patent No. 9,999,999, consents to the filing of reissue application No. 99/999,999 (or the present application, if filed with the initial application papers) for the reissue of U.S. Patent No. 9,999,999. Where the written consent of all the assignees to the filing of the reissue application cannot be obtained, applicant may under appropriate circumstances petition to the Office of Petitions (MPEP § 1002.02(b)) for a waiver under 37 CFR 1.183 of the requirement of 37 CFR 1.172, to permit the acceptance of the filing of the reissue application. The petition fee under 37 CFR 1.17(f) must be included with the petition. The reissue application can then be examined, but will not be allowed or issued without the consent of all the assignees as required by 37 CFR 1.172. See Baker Hughes Inc. v. Kirk, 921 F. Supp. 801, 809, 38 USPQ2d 1885, 1892 (D.D.C. 1995), N. B. Fassett, 1877 C.D. 32, 11 O.G. 420 (Comm’r Pat. 1877); James D. Wright, 1876 C.D. 217, 10 O.G. 587 (Comm’r Pat. 1876). Where a continuation reissue application is filed with a copy of the assignee consent from the parent reissue application, and the parent reissue application is not to be abandoned, the copy of the consent should not be accepted. Other than the exception noted below, where a divisional reissue application is filed with a copy of the assignee consent from the parent reissue application, regardless of whether or not the parent reissue application is to be abandoned, the copy of the consent should not be accepted. The copy of the consent from the parent does not indicate that the assignee has consented to the addition of the new invention of the divisional reissue application to the original patent, or to the addition of the new error correction of the continuation reissue application. (Presumably, a new correction has been added via the continuation, because the parent is still pending.) As noted above, OPAP will accord a filing date and send out a notice of missing parts stating that there is no proper consent and setting a period of time for filing the missing part and for payment of any surcharge required under 37 CFR 1.53(f) and 37 CFR 1.16(f). If, however, a divisional reissue application is being filed in response to a restriction requirement made in the parent reissue application, the assignee need not file a consent to the divided out invention now being submitted in the divisional application because consent has already been provided in the parent reissue application. See MPEP § 1451, Subsection I. Where a continuation reissue application is filed with a copy of the assignee consent from the parent reissue application, and the parent reissue application is, or will be abandoned, the copy of the consent should be accepted by the Office. Form paragraph 14.15 may be used to indicate that the consent of the assignee is lacking. This application is objected to under 37 CFR 1.172(a) as lacking the written consent of all assignees owning an undivided interest in the patent. The consent of the assignee must be in compliance with 37 CFR 1.172. See MPEP § 1410.01. A proper assent of the assignee in compliance with 37 CFR 1.172 and 3.73 is required in reply to this Office action. 1. This form paragraph may be used in an Office action which rejects any of the claims on other grounds. 2. If a consent document/statement has been submitted but is insufficient (e.g., not by all the assignees) or is otherwise ineffective (e.g., a conditional consent, or a copy of the consent from the parent reissue application was filed in this continuation reissue application and the parent reissue application is not being abandoned), an explanation of such is to be included following this form paragraph. 3. If the case is otherwise ready for allowance, this form paragraph should be followed by form paragraph 7.51 (insert the phrase --See above-- in bracket 1 of form paragraph 7.51). (B) specifying in the record of the reissue application where such evidence is recorded in the Office (e.g., reel and frame number, etc.). Compliance with 37 CFR 3.73 may be provided as part of the same paper in which the consent by assignee is provided. In connection with option (A) above, the submission of the documentary evidence to establish ownership must be accompanied by a statement affirming that the documentary evidence of the chain of title from the original owners to the assignee was, or concurrently is being, submitted for recordation pursuant to 37 CFR 3.11. Thus, when filing a 37 CFR 3.73 statement to establish ownership, an applicant or patent owner must also submit the relied-upon assignment document(s) to the Office for recordation, unless such a submission has already been previously made. If the 37 CFR 3.73 statement is not accompanied by a statement affirming that the documentary evidence was, or concurrently is being, submitted for recordation pursuant to 37 CFR 3.11, then the 37 CFR 3.73 statement will not be accepted, and the assignee(s) will not have established the right to take action in the patent application or the patent for which the 37 CFR 3.73 statement was submitted. This could result, for example, in an incomplete response, where a party stated to be the “assignee” signs a consent to the reissue to obviate a requirement for submission of assignee consent made in an Office action. Upon initial receipt of a reissue application, the examiner should inspect the application to determine whether the submission under 37 CFR 1.172 and 37 CFR 3.73 establishing the ownership of the assignee is present and sufficient. If an assignment document is attached with the 37 CFR 3.73 submission, the assignment should be reviewed to ensure that the named assignee is the same for the assignment document and the 37 CFR 3.73 statement, and that the assignment document is an assignment of the patent to be reissued to the assignee. If an assignment document is not attached with the 37 CFR 3.73 statement, but rather the reel and frame number where the assignment document is recorded in the USPTO is referenced in the 37 CFR 3.73 statement, it will be presumed that the assignment recorded in the USPTO supports the statement identifying the assignee. It will not be necessary for the examiner to obtain a copy of the recorded assignment document. If the submission under 37 CFR 1.172 and 37 CFR 3.73 is not present, form paragraph 14.16 may be used to indicate that the assignee has not provided evidence of ownership. The submission with respect to (a) and (b) to establish ownership must be signed by a party authorized to act on behalf of the assignee. See MPEP § 1410.01. An appropriate paper satisfying the requirements of 37 CFR 3.73 must be submitted in reply to this Office action. 2. If otherwise ready for allowance, this form paragraph should be followed by form paragraph 7.51 (insert the phrase --See above-- in bracket 1 of form paragraph 7.51). Just as the consent of assignee must be signed by a party authorized to act on behalf of the assignee, the submission with respect to 37 CFR 3.73 to establish ownership must be signed by a party authorized to act on behalf of the assignee. For applications filed on or after September 16, 2012, a patent practitioner of record may sign the statement (see 37 CFR 3.73(d)(3)). For applications filed before September 16, 2012, the signature of an attorney or agent registered to practice before the Office is not sufficient, unless that attorney or agent is authorized to act on behalf of the assignee. If the submission under 37 CFR 3.73 to establish ownership is not signed by a party authorized to sign pursuant to 37 CFR 3.73, the appropriate paragraphs of form paragraphs 14.16.01 through 14.16.06 may be used. This application is objected to under 37 CFR 1.172(a) as the assignee has not established its ownership interest in the patent for which reissue is being requested. An assignee must establish its ownership interest in order to support the consent to a reissue application required by37 CFR 1.172(a). The submission establishing the ownership interest of the assignee is informal. There is no indication of record that the party who signed the submission is an appropriate party to sign on behalf of the assignee. See 37 CFR 3.73. A proper submission establishing ownership interest in the patent, pursuant to 37 CFR 1.172(a), is required in response to this action. 1. This form paragraph should be followed: by one of form paragraphs 14.16.02 through 14.16.04.fti, and then optionally by form paragraph 14.16.06. 2. See MPEP § 1410.02. The person who signed the submission establishing ownership interest has failed to state in what capacity the submission on behalf of the corporation or other business entity was signed, and the person who signed it has not been established as being authorized to act on behalf of the assignee. For reissue applications filed on or after September 16, 2012, the submission establishing ownership may be signed by a patent practitioner of record. See 37 CFR 3.73; MPEP § 325. 1. This form paragraph is to be used when the person signing the submission establishing ownership interest does not state the person's capacity (e.g., as a recognized officer) to sign for the assignee, and is not established as being authorized to act on behalf of the assignee. For reissue applications filed on or after September 16, 2012, the submission establishing ownership may be signed by a patent practitioner of record (i.e., who has been given power in a power of attorney document in the file). 2. Use form paragraph 14.16.06 to explain how an official, other than a recognized officer, may properly sign a submission establishing ownership interest. The person who signed the submission establishing ownership interest is not recognized as an officer of the assignee, and the person who signed it has not been established as being authorized to act on behalf of the assignee. See MPEP § 324 (for applications filed before September 16, 2012) and § 325 (for applications filed on or after September 16, 2012). The submission establishing ownership interest was signed by applicant’s . For reissue applications filed before September 16, 2012, an attorney or agent of record is not authorized to sign a submission establishing ownership interest, unless the attorney or agent has been established as being authorized to act on behalf of the assignee. See MPEP § 324. 1. 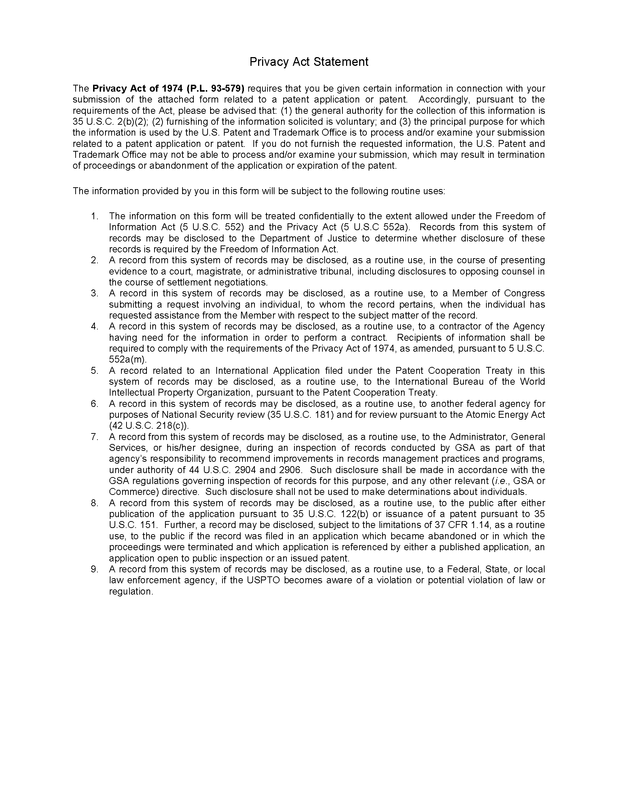 This form paragraph is to be used in reissue applications filed before September 16, 2012, when the person signing the submission establishing ownership interest is an attorney or agent of record who is not an authorized officer as defined in MPEP § 324 and has not been established as being authorized to act on behalf of the assignee. For reissue applications filed on or after September 16, 2012, the submission may be signed by a patent practitioner of record. See 37 CFR 3.73(d)(3). 3. In bracket 1, insert either --attorney-- or --agent--. It would be acceptable for a person, other than a recognized officer, to sign a submission establishing ownership interest, provided the record for the application includes a duly signed statement that the person is empowered to sign a submission establishing ownership interest and/or act on behalf of the assignee. Accordingly, a new submission establishing ownership interest which includes such a statement above, will be considered to be signed by an appropriate official of the assignee. A separately filed paper referencing the previously filed submission establishing ownership interest and containing a proper empowerment statement would also be acceptable. 1. This form paragraph MUST be preceded by form paragraphs 14.16.02, 14.16.03 or 14.16.04.fti. 2. When one of form paragraphs 14.16.02, 14.16.03 or 14.16.04.fti is used to indicate that a submission establishing ownership interest is not proper because it was not signed by a recognized officer, this form paragraph should be used to point out one way to correct the problem. Where the submission establishes the assignee’s ownership as to the patent, the assignee’s ownership as to the reissue application will be presumed. Accordingly, a submission as to the ownership of the patent will be construed to satisfy the 37 CFR 1.172 (and 37 CFR 3.73) requirements for establishing ownership of the application. Thus, a terminal disclaimer can be filed in a reissue application where ownership of the patent has been established, without the need for a separate submission under 37 CFR 3.73 showing ownership of the reissue application. However, if there is a submission under 37 CFR 3.73 present in the patent file, but there is no copy in the reissue application file, a copy of the submission under 37 CFR 3.73 for the patent must be submitted in the reissue file. Even if the submission states that it is establishing ownership of the reissue application (rather than the patent), the submission should be accepted by the examiner as also establishing ownership in the patent. The documentation in the submission establishing ownership of the reissue application must, of necessity, include chain of title as to the patent. The examiner must inspect both the consent and documentary evidence of ownership to determine whether the requirements of 37 CFR 1.172 have been met. The assignee identified by the documentary evidence must be the same assignee which signed the consent. Also, the person who signs the consent for the assignee and the person who signs the submission of evidence of ownership for the assignee must both be persons having authority to do so. See also MPEP §§ 324 and 325. The reissue patent will be granted to the original patentee, their legal representatives or assigns as the interest may appear.